Four words may send a person to the operating table, but countless questions remain. Will I walk again? What will my prosthesis look like? Do I have to tell my boss? What about that two-year gap on my résumé? People who have had amputations face new challenges and doubts. Simply walking across the room becomes an impossible dance with a titanium robot. Extension cords and uneven steps become new archrivals. Fortunately, University of Michigan (U-M) Health Systems in Ann Arbor has developed a unique solution for helping patients confront life with one limb less: a limb-loss support group. The dog is certainly the most improbable member of the group. Lefty was destined to be an amputee from birth; a deformed right leg gave her a one-way ticket from her breeder’s house to an animal shelter. A veterinarian removed the deformed leg and as soon as the stitches came out, Lefty joined the group. 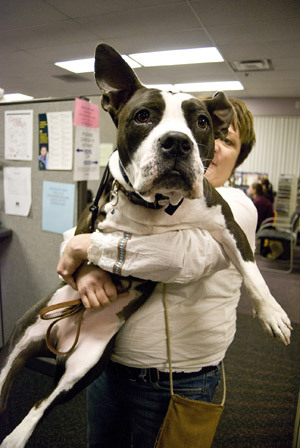 The dog’s owner—a U-M nurse—brings Lefty to the meetings. The veteran-turned-salesman brags to the group about how he negotiated thousand dollar sales from his hospital bed. The nurse describes a recent interaction she cannot shake; the fear she saw in a patient’s eyes when amputation became the only option. The three-legged dog makes her rounds, convincing the factory worker to share his doughnut. Everyone in the room nods in approval. Stories like this seem to give the group fuel to continue living and loving life after limb loss. Amputation has a way of breaking down barriers. This is a diverse group formed by misfortune; the absence of an appendage is really the only tacit bond these individuals have. Socioeconomic status varies tremendously and every surrounding community has a representative at this meeting. This group confirms that tragedy does not care what your zip code is or how many zeros are in your paycheck. Funded jointly by the U-M Cardiovascular Center and the U-M Orthotics and Prosthetics Center, it is the hospital’s way of recognizing that its job does not end on the operating table; life after amputation only begins when a limb comes off. The group meets monthly and addresses an array of topics pertaining to life after limb loss. Conversations range from cooking with one arm to the serious matter of amputation-induced depression. The hospital realized that when the anesthesia fades, depression is typically at the bedside to wake up the patient. Many members in the group struggled with depression both before and immediately after their amputations. “I am glad that I didn’t do what I thought I was going to do,” said one group member recalling the days immediately following his amputation. When an arm or a leg comes off, everything changes. Familial chaos ensues when the person who is a family’s main source of income is unable to work. A fresh amputation stands between old friends who used to play touch football or spend time gardening together. Issues of depression and life adjustments are outside the realm of a surgeon’s work (let’s be honest, surgeons are called “sawbones” for a reason). On an amputation surgery, their sole objective is to remove the faulty appendage. When the last stitch is tied, the limb-loss support group and its professional leaders take over. The group meets under the guidance of Maggie Kelly, LMSW, MPH, and limb-loss coordinator Shauna Mote, who has also lost a limb, Mote is able to offer a unique credibility to the group: She, too, has been in a hospital bed facing the prospect of amputation. Mote holds a unique position, the only paid position of its kind in the nation. The goal of the support group is to accompany patients through the entire process of living with an amputation. Mote prefers to work with the patient prior to surgery. “Amputation is a tough process to go through … to realize that life has changed. There is certainly a grieving process and it is a very individual process for everybody,” she explains. Either Mote or Kelly will meet with the patient in the hospital prior to amputation to answer questions and calm fears. 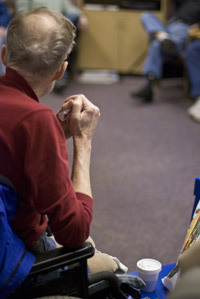 Some patients are very quick to connect with a support group; others are more reluctant to meet with others who have had amputations. “Some people may take years before they are comfortable going to an amputee support group,” Kelly explains. Although both have different backgrounds, Mote and Kelly function symbiotically as group leaders. As a clinical social worker, Kelly specializes in issues such as resource concerns and mental health. Mote, on the other hand, draws from her own experience of having lost a limb, as peer support and lifestyle education are her forte. Struggles abound for both the group members and their leaders since all are well acquainted with the litanies of suffering. At times, the struggles are immense and glaringly obvious—a marriage has dissolved because of the amputation. Some struggles are silently present—the uncomfortable feeling of attaching a rigid piece of metal to a dynamic human body. Still something keeps the group members going. Many wear their prosthetic leg like a badge. They beat those fateful four words and they are proud to show it. Their prosthetic leg is the marriage of art and science, a medley of titanium and carbon fiber united together in an assault on life’s misfortunes. It is strange to walk into a limb-loss support meeting and hear laughter rather than tears. Where do their high spirits come from? It may be from the camaraderie of the group. Perhaps it is in the group’s well-trained and resilient social worker and limb loss coordinator. The goofy three-legged dog rolling around at their meetings may keep them going. Maybe it is a little bit of everything—fellow amputees, dedicated leaders, three-legged dog kisses—that keeps them going. — A. Trevor Sutton is a freelance writer based in St. Louis.